Have you ever stood in front of the mirror and looked at your body shape. “ Am I good?”. Everyone must have had this experience. But do you know how to measure your ideal weight? The incorrect measurement can damage your self esteem, image and diet type. Resulting in inaccurate measurement and wrong perception of healthiness. So what is the best formula for ideal body measurement? 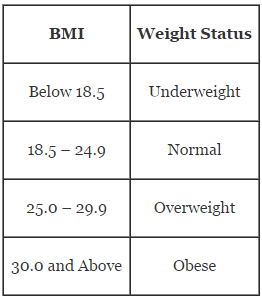 The answer is Body Mass Index. It is a reliable indicator of body fatness for most people and is used to screen for weight categories that may lead to health problems. Invented by Adolphe Quetelet and easily to use as a general calculation defined as the individual’s body weight divided by the square of his or her height. 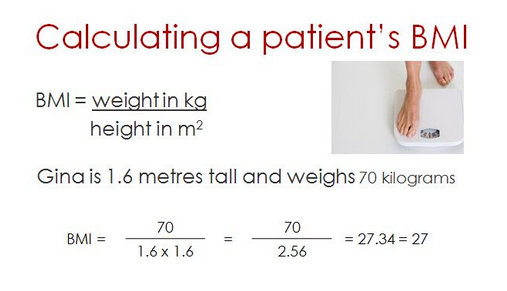 The formulae universally used in medicine produce a unit of measure of kg/m2. Finally, you can easily discover if you’re overweight, underweight , normal or obesity. If you find yourself beyond the normal limit such as obese or overweight, don’t explain it away as “too much fat”. Chances are, the problem won’t go away. Ignoring your weight problem can lead to more serious problems in the future. By losing some weight you can boost your self-esteem and have a healthy, happy way to live that will literally be life changing. Map out your meals, healthy snacks and even your workouts. Lose weight gradually. Stay active and exercise at least 30 minutes sessions, 3 times per week. Limit fat consumption to less than 30% of the daily caloric intake. Aim to lose weight steadily, around 0.5-1 kg per week. And for you who categorized as underweight person, don’t just grab everything in the fridge. To gain weight, you need to consume more calories every day than you burn with physical activity. You should choose foods that are nutrient dense instead of settling for high calorie junk foods. Nutrient dense foods include fruits, vegetables and whole grains. Foods that are both energy and nutrient dense include legumes, nuts, seeds, olives, and avocados. You may also want to increase your consumption of dairy products, meats, seafood and poultry. If you’re not used to eating much at any one time, you may prefer to eat several small meals or snacks throughout the day. If you’d rather eat three meals each day, increase your portion sizes or add more foods to each meal. Prefer to put starchy foods such as potatoes, sweet corn, rice or pasta as energy-dense carbohydrate sources on your plate. Increase your calorie intake by eating a larger volume of food. Next important step, divide your calcium daily consumption as 3 different portion which you have to consume in 3 different times. For example, 190 ml of milk for breakfast, one cup of yoghurt for 1st snack and one block of cheese or other dairy product for 2nd snack. The most important key to manage and control your diet with strong willingness to increase or reduce your current weight, is maintaining the balancing of protein, carbohydrate and fat with various kind of vegetables in various colours. Do remember for keep doing regular exercise to support your healthy activity. Don’t ever worries for your colleagues shape or weight. No one perfect in this world, but healthy should be number one. Keep your BMI still in the normal range. Happy healthy. ‹ Hearing Conservation…Protecting workers from noise exposure?